So Toronto’s weather took a weird twist pushing the Humidex into the 40s just in time for the Opera Five movie themed fundraiser at Atelier Rosemarie Umetsu last night. And some people still managed to wear suits and ties and stuff. Made of sterner stuff than me I tell you. And even more props to the ladies who were sporting Rosemarie’s creations. They looked great but some of them must have been hell in the heat. It was an interesting format with seven singers and two pianists appearing in various combinations and guests having an opportunity to sponsor a singer to sing their “feature” aria. It was fun and there were some fine singers on display. Two I’ve seen and enjoyed in the past were baritone Geoffrey Sirett and coloratura soprano Teiya Kasahara. Both were on good form with some fine Escamillo from Geoffrey and the mad scene from Lucia from Teiya in a rather good arrangement for voice, flute and piano. The other five were new to me but I’d happily go see any of them. Favourite moments for me would be some fine Carmen from the unpronounceable Olenka Harasymowycz (who looks disturbingly like Maria Ewing), a very cute “Poor Wandering One” from Caitlin Wood and a very fine “Ebben…” (from Catalani’s La Wally) from Calgary’s Krista de Silva. Accompaniment was from music director Mai Nash and Jo Greenaway on piano with flautist Amelia Lyon. So, a fun event which seemed to be raising quite a bit of much needed cash. 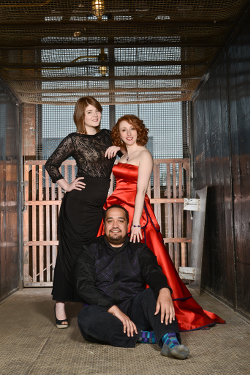 The first show it will be helping fund is In Pace Requiescat; a trio of one act operas based on Edgar Allen Poe stories. There will be The Cask of Amontillado by Daniel Pinkham, La Chute de la Maison d’Usher by Claude Debussy and the world première of The Masque of the Red Death by Cecilia Livingston. Performances will be at the Arts and letters Club on Elm Street on the 27th, 30th and 31st of October. Tickets are available from 05inpace.eventbrite.ca and are $30 ($25 concessions). This entry was posted in Toronto opera news and views and tagged de silva, greenaway, harasymowycz, kasahara, nash, opera five, sirett, umetsu, wood by operaramblings. Bookmark the permalink. It WAS a great night and was a pleasure to participate in supporting this forward thinking and young opera company! And I was thinking “40? Wow, that’s a cold snap!” Duh, Celsius! Meanwhile, that sounds like a great program! Entirely off-topic, but what is Frank Stronach’s media profile/reputation like in Canada? Does he even have much of one? I ask because he’s back in Austria with a new party that’s running in the imminent general election. The one redeeming aspect of his tea party programme is that he split the far right vote – until he blurted out his support for the death penalty on TV the other night (according to Frank, Austria is apparently infested with ‘professional hit men’). It’s all very ‘colourful’, up to a point. More on-topic, representing “the European past as seen by US opera goers” was very amusing. Frank hasn’t been heard of here for ages. His daughter Belinda is quite well known. She was elected to the Federal parliament as a Conservative but crossed the floor and was a Liberal cabinet minister for a few months. Then she got cancer from which she recovered. The Regional Cancer Centre at Southlake Regional Hospital in Newmarket Ontario was renamed the Stronach Cancer Centre after a suitably large donation. It’s a very efficient operation as it happens. Interesting. I suspect he got involved in Austrian politics because his money goes further in a small country and if/when he implodes, he can return to Canada with few there knowing what a joke he made of himself. It was worth it for the short period he did damage to the far right but not for the things he’s been saying recently. If his party somehow ends up in a coalition with the Conservatives and far right I dread to think what policies will be introduced. When Vilar got into trouble I recall that he stepped in to save the Musikverein’s expansion plans. The donation was large enough to get one of the new underground halls (alas with terrible acoustics) named the Magna Saal.